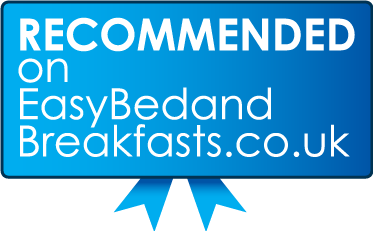 We offer Bed and Breakfast in our home, Inver Park House, which has achieved a **** Bed and Breakfast award from VisitScotland 'in recognition of an excellent standard of facilities and services'. In 2013 we achieved a Category 1 'Unassisted Wheelchair Use' Accessibility award are really pleased about this! Breakfast is served in the south-east facing sun lounge, from which we have brilliant views over the Moray Firth. We completed our building work in 2010. It took 6 years! We now have 3 lovely, large ensuite rooms for B&B on the ground floor. These are all bookable online. On the ground floor our Traditional Double Room has an antique bedroom suite, a view over the Moray Firth, and an ensuite with bath and separate shower. This room was refurbished and redecorated in December 2018. The Botanical Room with 3 single beds looks out over the caravan park, and has a large wetroom with under-tile heating. This room is also suitable for use by disabled persons, and the shower room is equipped with grab rails, shower seat, etc. This room was refurbished and redecorated in January 2017, and is now a nice bright yellow room. Peaches and Cream, which is our Family room, also looks out over the caravan park, and has one double bed and one single bed, and a large bathroom with shower over the bath. This room was redecorated early in 2018. All the rooms are furnished to a high standard. All have TVs with Freeview, hairdryers, and tea/coffee/hot chocolate making facilities, and all have fridges, which can be useful for sandwiches, snacks etc. Although I do not do evening meals (unless you arrive really late and starving) the Bay Owl Restaurant is only 400 yards down the road, and is excellent, so you don't need to worry. It is a good idea to book there, especially at the weekend (Tel. 01593 731356, email bayowl@btconnect.com). The Bay Owl is closed on Mondays. Breakfast is a fairly moveable feast, time-wise, and I offer a range of options from something light and healthy to a full fry-up, with more toast than you can eat, lots of cereals, fruit, homemade preserves, oatcakes, tea, real coffee, etc. The cost is from £40 per adult per night, and there can be a 10% discount for walkers and cyclists who are doing the 'end-to-end' route of John o' Groats to Land's end, or Land's End to John o' Groats, or walking or cycling the North Coast 500 route, or walking the 'John o' Groats' trail, if you are doing it to raise money for charity. I do not give discounts for recreational cyclists, whether or not your cycle is on the back of your car, or your car is somewhere within the larger area and you have arrived here on a bike. Sorry! I also charge modest single person supplements, for the 'Traditional Double' room there is a £15 supplement, and for the 'Peaches and Cream' room there is a £10 supplement for single occupancy. There is no single person supplemnt for the 'Botanical Room'. There are also discounts for children - I charge £15 per night for each child of 3 - 12 years, and £20 per night for teenagers of 13 - 16 years. 17 year olds and above are adults, and under-3s are free. Payment in cash is always very acceptable, but I do now have a card facility, so can accept payment using a wide variety of cards (even Amex!). Even payment by Paypal can be accommodated. It is now possible to book accommodation online. I am sorry but I do not allow dogs in the house, apart from trained Assistance Dogs. If you are travelling with your pet, and our Holiday Caravan 1, 'Castle View', is available, it may well be possible for you to be accommodated comfortably there, and come in to the house for breakfast. Do check the 'availability' on the 'Holiday Caravan' bit of the Inver Caravan Park website to see if this would be a possibility for the dates you have in mind.